A one-day event that partners a small group of grades 11 & 12 students with a local business to work on a real business challenge that is currently impacting their company. The students will work on-site at the company (if possible) where they will receive mentorship and guidance from a company representative. Students work through problem solving methods to create one or more solutions to the company's challenge. At the end of the day, students will present their solution(s) to the company representatives. on a real challenge facing their business. "It's a great way for young, motivated high school students to get work experience doing things they love, and for companies to leverage emerging talent." "Great chance to work as if in the real world alongside real people and the challenge they are currently facing." "Exceptional! I feel that I have gained so much knowledge and experience. I have a whole new understanding of the possibilities of my future. Overall such an amazing day, I absolutely loved it." 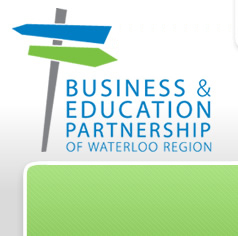 "This program that SHSM and the BEP provides the students with unique opportunities. The students said they felt valued. They commented that they felt as they could actually make a contribution to real problems and challenges the tech companies are dealing with and that what they've learned in school could be put into action and "tested out" with real problems. The day both inspired and opened students' eyes to careers and the types of creative opportunities they might like to pursue." If you are a company interested in participating in Challenge Day, please contact Scott Verhoeve.